HD(CP)² is the acronym for "High definition clouds and precipitation for advancing climate prediction". 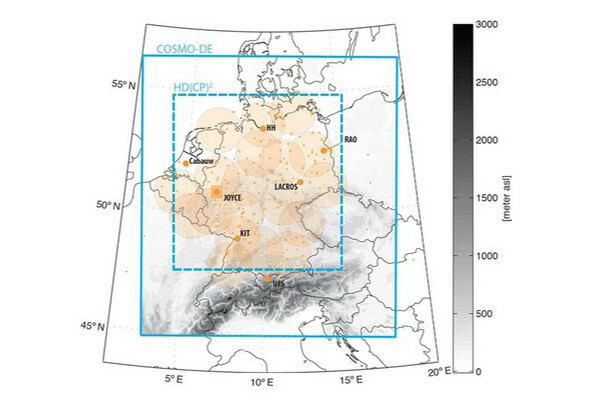 This project is a BMBF funded German-wide research initiative to improve our understanding of cloud and precipitation processes and their implication for climate prediction. The main goal of this initiative is to decrease the uncertainties in climate scenario model calculations that are based on cloud and precipitation processes. HD(CP)2 will strive to build and use a model capable of very high-resolution (100 m horizontal, 10-50 m vertical) simulations. Figure 1 shows the region for the HD(CP)² model simulations together with key observation sites and the rain radar network used. Project O2 “HD(CP)² Full domain observations” will integrate observations over the full domain of interest in HD(CP)² from satellite data and ground-based observation networks to create an observational database which will serve high-resolution model development and validation, cloud and precipitation parametrization development for climate models, and the formulation of climate prediction constraints. The coordinator of project O2 is Prof. Johannes Quaas from the Leipzig Institute for Meteorology (LIM) at the University of Leipzig. Dr. Hartwig Deneke (principle investigator) and Sebastian Bley (PhD student) from the TROPOS are principally involved in work package 1 (Full-domain observations of water vapour and cloud distributions) and work package 4 (Exploitation of full-domain observations) which are both sub-projects of O2. Work package 1 will contribute 3D water vapour and cloud distributions over the full HD(CP)2 domain to the HD(CP)2 observations database. Meteosat Second Generation (MSG) and CloudSat observations will be combined with the regional ground-based ceilometer network. 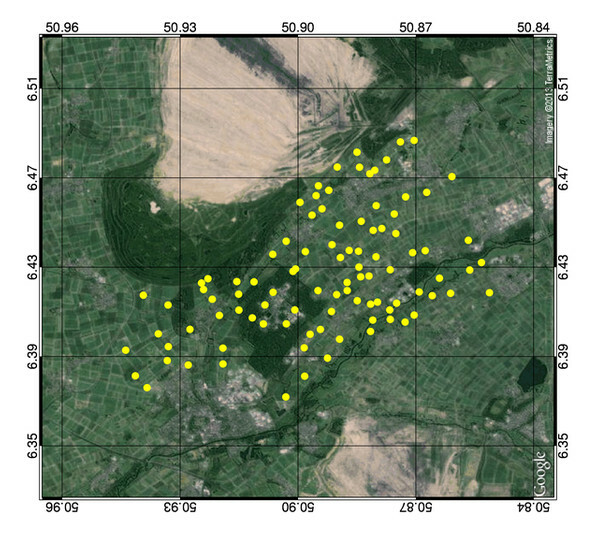 MSG day-time cloud property retrievals will be extended to the high-resolution visible (HRV) channel (1 km resolution at nadir), and incorporated in the database. In work package 2 objective measures will be developed to characterize cloud morphology and geometric characteristics using MSG observations, the instrumental limitations for these measures will be evaluated using high resolution large-eddy simulation (LES) output in cooperation with Project M2. An object-based analysis of the temporal development of clouds will be performed by considering the evolution of cloud properties along air-mass trajectories in a Lagrangian reference system. Data from synchronized radar, microwave radiometer and sky imager measurements will be converted to time-series of three-dimensional cloud properties, which in turn will be utilized in existing 3D Monte-Carlo radiation transfer model [Macke et al., 1999] to close the radiative flux measurements from our surface radiation network (as seen in figure 2) and quantify the effect of cloud-inhomogeneity on cloud radiative forcing [Scheirer and Macke, 2003]. The cloud fields from the radar / microwave radiometer network during the HOPE-Julich campaign will be interpolated into a regular grid. High resolution sky imager data will be used to extrapolate the potential gaps in the radar scans and to obtain 3D cloud morphology information. This will be helpful in determining the optimal grid size to account for the 3D structure of the clouds. In addition, the data from high resolution cloud models will be used for further cloud-radiation closure studies. Macke, A., D. L. Mitchell, and L. V. Bremen, 1999: Monte Carlo radiative transfer calculations for inhomogeneous mixed phase clouds. Phys. Chem. Earth, 24B, 237–241. Scheirer, R. and A. Macke (2003): Cloud-inhomogeneity and broadband solar fluxes, Journal of Geophysical Research, 108(D19), doi:10.1029/2002JD003321.